Brian Savage, born in Sudbury Ontario on Feb 24-1971, started his NHL career with the Montreal Canadiens in the 1993 season. Brian was picked # 171 overall in round 8 of the 1991 entry draft by Montreal. During his stay with the Habs, the big guy suffered a career threatning neck injury when playing a game against the L.A. Kings, giving him a short 38 game season. 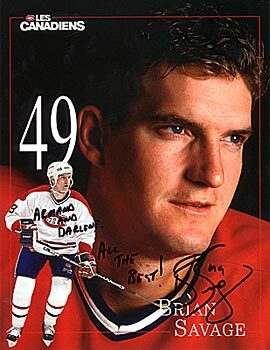 Making a come back the following year, Brian had played 461 games with 155 goals and 130 assists as a Habitant. Brian had his best season in 1997-98 scoring 26 goals. In the 2001-02 season, Brian was traded to the Phoenix Coyotes for a hefty payroll of $2.2 million. We wish Brian the best of luck with his new team mates in Phoenix.